To have you enjoy Mount Takao containing various charm more significantly. Including the introduction of walk, the hiking route which I want to recommend, one action introduces trivia tickling the basic data such as geography, the climate, intellectual curiosity. If you can see-----, a dismantling new book of Mount Takao should be able to surely meet the person who has come once all over the new shelf of Mount Takao. This is the main trail to the peak and is recommended to the beginner hikers as the cable car and chair-lift are also available. The Monkey Park, the Wild Plant Garden, cedar street, Tako sugi (Octopus Shaped Cedar) and Takao-san Yakuo-in Temple are on this trail. There are a lot of resting places and restaurants. It is recommended for hikers those who want to enjoy the trail to the peak at a slow pace. Kiyotaki station of Mt. Takao cable car. Opened in 1927 (the 2nd year of Showa period). The station name was named after Kiyotaki fall beside the entrance of trail 1. The cable car platform is located on the left side of the building. The lift station near Kiyotaki station is Sanroku station. There is a open space in front of Kiyotaki station and sometimes various kinds of events are held. Trails 1 runs on the right hand side of the open space and Trail 6 and Trail Mt. Inari runs from the left hand side. The type of cable car is called cable railway, two cars connected to operation room in the middle of the mountain via cables from the operation room. When one car climbs up, and the other go down. Greenish car is called Aoba and the red called momiji. Green toned car is called Aoba, and the reddish one called Momiji. The shape of the car fit steep slope (31.18 degrees maximum). The picture shows the Kiyotake station where is relatively gentle slope. Number of passengers are 135. Operates every 15 minutes. Is popular among people who want to enjoy mountain air. Twin-seater chair lift without covers makes passengers feel refreshed. Enjoy one-way 12 minutes ride while looking down the view of forests on both sides of the lift. At the steep curve in the middle of the trail 1, go straight without turning this steep curve and then go up the wooden stairs. This is the Konpiradai rest place and Konpira shrine. Visitors can rest at benches but there is no restrooms. Visitors can enjoy wide view on the East side of the mountain and even see Mt. Tsukuba in Ibaragi prefecture when the weather is fine. Looking down Koshu street with ginkgo trees and they turn yellow during autumn. Located at the East hill side of Beer Mount (the picture is taken from the summit side) where main track of Trail 1 and in front of the ticket gate of cable car emerge and is crowded with visitors. 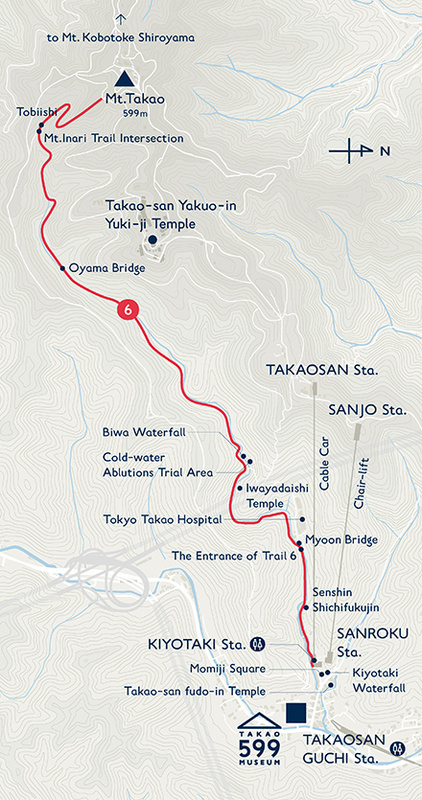 This is also crossed with Trail 2 and a trail on the north runs towards waterfall Jyataki and another trail on the south is connected to Trail 6 via waterfall Biwataki. This open space has benches and visitors can rest and make climbing plans. In Mt. Takao, many Japanese monkey inhabit but they hardly every come across with mountain climbers. About 60 monkeys live in the Monkey Park and visitors can enjoy seeing them by the window or look down from the wall. Staff can always answer questions from visitors. The Wild Plant Garden is 2,800 square meters and grow almost 300 kinds of wild plants. Mt. Takao has been a place where rare and precious wild plants grow naturally but some kinds are difficult to find in the mountains. These wild plants are mainly grow in the garden in a way close to the natural environment. “Ikoino yakata” is the bird watching house and visitors can enjoy birds and insects inhabit in Mt. Takao. Open: January, February and December 9:30 a.m. - 4 p.m.
March, April: 10 a.m. - 4 p.m.
More than 450 years old large cedar tree. Is a unique shape with curved roots and holes on the roots appear on the ground resembles the shape of octopus. It has been told that this cedar curved the root towards mountain side once goblins in the mountain decided to cut its root blocking the trail. Many visitors touch its root for capitalizing this story as “Opening Hoursing your way”. Recently, to prevent damages on trees, the tree is fenced and “lucky charm hippari dako(literally meaning attracting popularity)” is placed instead of touching the tree root. The wooden gate crosses over the paved approach towards Yakuouin which borders the sacred are of Yakuoin. From this gate to the temple gate, red lanterns on both sides of approach display more sacred atmosphere. “Jinbendo”on the left hand side after walking under the gate enshrines the Ennogyojya who established the way of Shugendo, one of Japan's ancient mountain worship centering on ascetic training in mountainous areas. Trail 2 crosses in front of Jyoshin-mon gate and from the stairs on the south leads to Trail 2 and Trail 3 and a trail on the north lead to Trail 2 and Trail 4. The stairs on the right hand side of the gate lead to the rest area and have “the monument of Forestry Agency”. As walking through the approach with red lanterns and large cedar trees on sides, the approach split into two, the left is Otokozaka (male slope) with stone stairways and Onnazaka (female slope) with gentle slope. Then it the approaches emerges again. Taking either way will lead to Yakuoin temple. The number of stone stairway is 108, the number of earthly desires. It has been said that walking up these stairs will eliminate earthly desires one by one. Busshari Relics Stupa is at the open space called “Mt. Takao Yukien” by walking up the hill after Otokozaka and Onnazaka emerges. The tower was established enshrines Busshari (Buddha's aches) represent the friendship between Japan and Thailand. Established in 744, 16th year of Tempo period, one of head temples of the Shingon-shu Chisan-ha Sect and enshrines the deity of “Izuna Dainagon”, as as the principle image, a personified deity of Fudo Myo-o (Immovable King). Long-nosed goblins are said to be the guards of the mountain. Mt. Takao was originally flourish as the place for ascetic training for Shugendo but during the civil war period, it became under the protection of powerful warrior lords. In the middle of Edo period (17th to early 19th century), it has become widely known for commoners as the place for worship and for leisure what it is today. It is also considered as the sacred place to preserve the precious natural environment. The building is designed in a skilled manner and many of them are designated as tangible cultural property. The temple is also known as syncretization of Shinto with Buddhism and has a number of shrine gates. Visitors can participate “Ogoma-shugo”traing at the main building. Daihonbou restaurant offers shojin-ryori, Buddhist Vegetarian Cuisine by making a reservation. Reservation for “Ogoma-shugyou” training and shojin-ryori: 042-661-1115. Walk straight on the approach in front of stone stairways of Niou-mon gate and walk further besides Kyakuden and Daihonbou Fukutoku-benzaiten, visitors can find Fukutoku-benzaiten. The approach from Fukutoku-benzaiten connects to Trail 3 and also called as “Fujimichi” street. 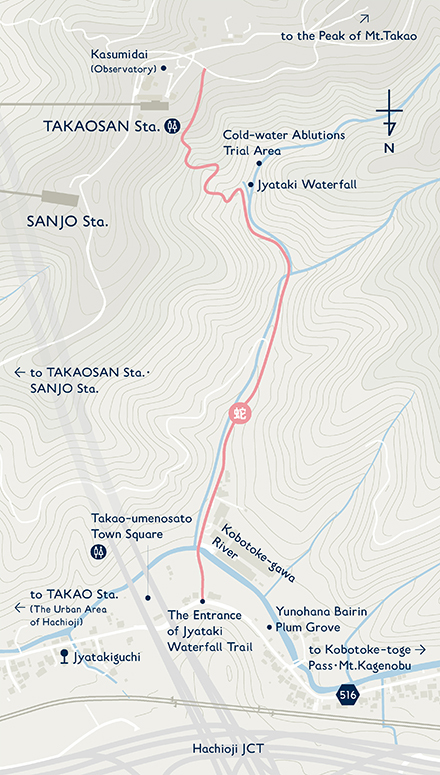 The walking distance becomes longer but walking from from Trail 1 to Trail 3 via “Fujimichi” street and then at the crossroad, take Trail 5 towards Trail 1 right below the summit of Mt. Takao is the way to the summit without taking stairways. The trail on the right is called “Irohanomori” named after Japanese ancient alphabet “iroha” because description of trees on sides of the trail is based on iroha alphabet. After crossing Trail 4, it reaches the intersection with Hikagesawa trail and then connects to Hikagesawa bus stop. The trail is called as “Sancho-shita” and then again becomes paved and uphill. This intersection has large restroom with nursing room. The trail a little bit further than the restroom is the Trail 5, a loop trail. On the south, the trail is connected to Trail 3 and Trail 6 when walking down the hill and on the north, the trail is connected to Trail 5 on the left and Trail 4 on the right. When going up the hill in the center, visitors can reach the summit of Mt. Takao. The visitor center at the summit have descriptions of animals, natural environment and histories of Mt. Takao using panels and models. The guide walk tour to observe nature is offered by the guides. Opening hours: 10 a.m. - 4 p.m. This is the loop trail from Kasumidai, where TAKAOSAN Sta. 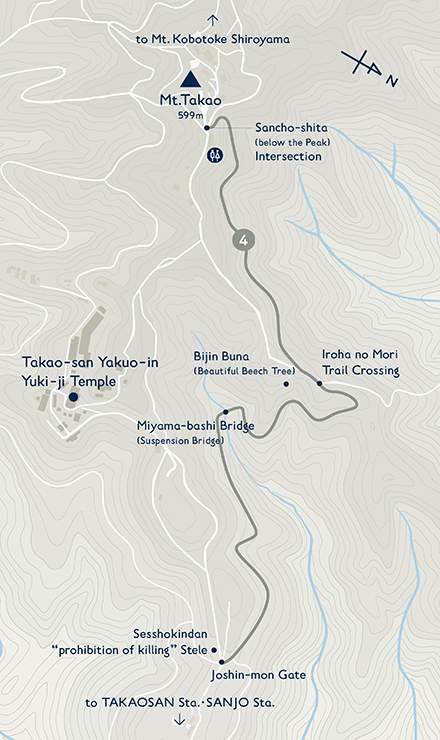 of cable car is located, to Jyoshin-mon Gate runsbr> in the middle of Mt. Takao. Hikers can observe natural forests of broad-leaved evergreen trees, such as oak, on the sunny South Face and broad-leaved deciduous trees, such as fagus japonica, on the North Face of the mountain. It is recommended for hikers those who want to enjoy the trail in forests and prefer slow-paced walking while avoiding the congestion of Trail 1. 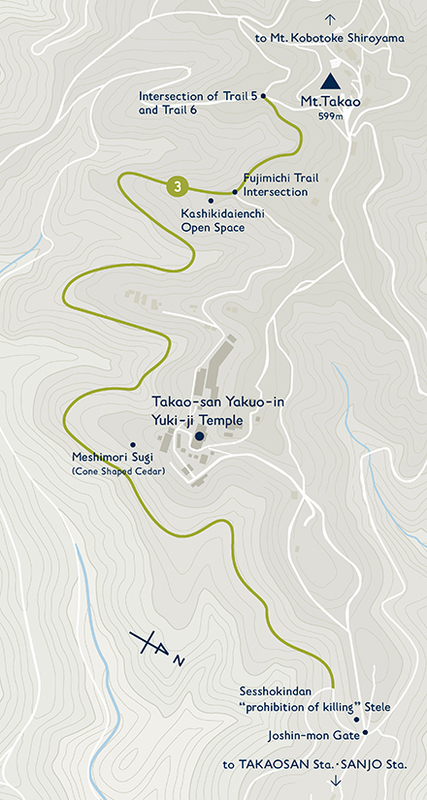 The south loop of the Trail 2 and the entrance to a trail towards Biwataki waterfall is located besides the observatory past Beer Mount. It might be difficult to find this place when coming from the cable car drop off to the rise of the trail. When going down the stairway, the trail becomes very bumpy and then crosses with a trail to Biwataki. This trail towards Biwataki is rugged terrain and for an expert. It is recommended to wear special shoes suitable for mountain climbing such as trekking shoes. After passing through the intersection at Biwataki, the trail becomes gentle steep with evergreen broadleaf trees. When passing through stairway, there is another intersection where Trail 3 crosses. And going up the hill, it will be connected to the front of Jyoshin-mon gate. The intersection of Trail 2 and Trail 4 is right after the intersection of the north of Jyoshin-mon gate. Trail 2 is made with wooden stairs. Once the stairway is finished, the trail become gentle but some parts have narrow width of the trails. Please watch your steps. The intersection of Jyataki trail and Trail 2 at the bottom of stairway on the north of Kasumidai. When walking through a narrow downhill, the zigzag like trails continues and then find the small building. The entrance of north loop of Trail 2 is at the opposite side of the observatory on the south at Kasumidai. It may be difficult to find as the entrance is a narrow stairways. Most of climbers does not think it is for beginners, the down stairway is very steep. Once this stairway is over, the trail is very gentle. The trail starts at the left hand side of Jyoshin-mon Gate to the peak and is famous for Japanese Judas trees along the trail. Hikers can enjoy all kinds of sceneries such as walking in a forest, open spaces with spectacular views, wooden bridge over streams and so on. This trail is less crowded compared to other trails, thus it is recommended for those who enjoy and focus on observing broad-leaved evergreen trees like oak trees, wild plants, wild birds and insects. The intersection with Trail 2 is located when walking down a sideway in front of Jyohsinmon. The trail is in forest for a while but the slope is relatively gentle without rocks and root of trees. Visitors can enjoy the scenery on the trail. This trail is easy to walk but some parts are shallow as shown in the picture because this trail is on the slope. Please pay special attention to the ground. There are several bridges over the small valley on Trail 3. Kashikidai open space is the rest place after passing through the wooden bridge with railing and go up the steep stairway. Hiked up the stairway, there is a Kashikidai open space with benches. This is a wide and open space and some part have decayed trees and dead leaves piled up which is suitable for observing plants, insects and mushrooms. Fujimichi which extends from the side of Daihonbo of Mt. Takao Yakuoin temple is connected to the middle of Trail 3. Trail 3 is also named as Japanese Judas Tree Trail because there are many of them planted in the early Showa period (early 20th century). In autumn, their fallen leaves gives subtle sweet scent. Trail 3 end at this intersection with Trail 5 and Trail 6. Trail 5 lead to the summit, Trail 1 on the right to descend Mt. Takao and Inariyama trail's stairway to the left. When the summit is congested, take Trail 6 and rest at the open space. The entire trail is through the forests. Hikers can enjoy hearing many kinds of birds chirping and singing season by season. It does not have much difference in height and there is only one suspension bridge in Mt. Takao “Miyama-bashi Bridge” which makes this trail one of the most popular trails. Broad-leaved deciduous trees including Fagus, unique to Mt. Takao, are there. Hikers can enjoy the fresh and cool air of forest. The intersection with Trail 2 (stairway) appears when going down the trail in front of Jyoshinmon on the north. From this point to the Suspension Bridge, the slope is gentle and it is easy to walk. The forest mainly consist of deciduous broad-leaved trees including fagus japonica. Total length: 36 meters. The only suspension bridge in Mt. Takao. The entire area is covered with beautiful green in the season of young leaves. The trail after crossing the bridge have large curve and will be uphill. The intersection with Iroha-no-mori appears when walking along the north face of the mountain. Trail 4 and Iroha-no-mori trail crosses angled so that it looks merged around the area near this intersection. The area has rest place with benches. In the forest, it is easy to see the direction. It is a good place to check the upcoming route. When it is close to the intersection near the summit, the trail becomes even more shady and dark with stair-like ground. The slope is not steep but one step of the stair is wide. Please consider this in mind when going through this trail not to get too tired. This trail crosses with Trail 5 at the intersection right before the summit on Trail 1. 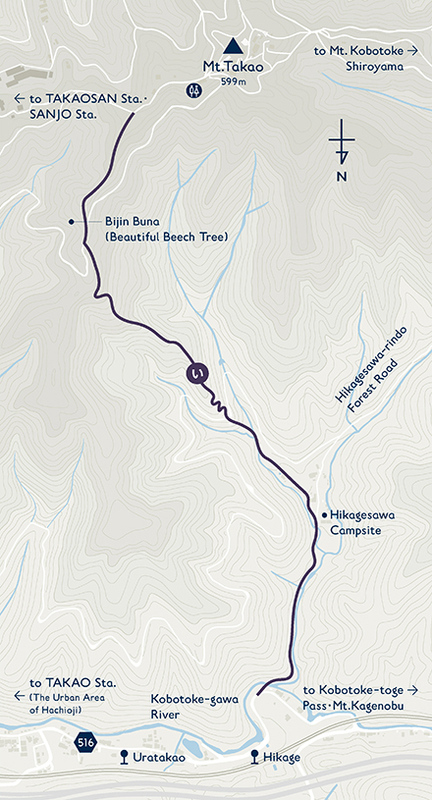 This loop trail is right below and surrounding the peak of Mt. Takao. It is 500 meters above sea level but the width of the trail is wide and does not have much difference in height. So hikers can enjoy a relaxing walk with the beautiful sceneries on both south and north sides. Additionally, in spring, we can enjoy a various kinds of flowers of Mt. Takao blooming. Trail 1 and this trail is crossed below the summit. On the north face, Trail 4 is close by, and on the south face, the paved trail is connected to Trail 3 and Trail 6. At the end of Edo period (around 19th century), this cedar was planted by Tarozaemon Egawa, a local governer of Izu Nirayama area because he believed that forestation is required. This is the oldest man-made forest and there are more than 50 of 150 years old trees. The thickest trunk of the tree is one meter in diameter. The trail from the summit to the Kobotokeshiroyama area is crossed as covering the stairways from the summit. Trail 5 is split to the north and the south and brightness and atmosphere of the trail differs. The southern most part of Trail 5 and crossed with Mt. Inari Trail. There is a wide open space in front of the steep stairway to the summit. Climbers are never bored with gentle slopes as well as wooden path to cross over the valley. Trail 3 and Trail 6 end at this intersection with Trail 5. It looks like the alphabet K which makes climbers confused. Taking the paved Trail 5 will lead to the intersection below the Trail1. This trail runs along the stream and you can feel the freshness and cool air even in summer. A part of trail has stepping stones to ascend the stream. This trail is also called as “the trail of water” because hikers can see monks going through ascetic trainings at Biwa Waterfall even in winter which is located in the midway of the trail. Many hikers prefer this rough trail. It is also preferred by those who want to avoid hiking under the direct sunlight. 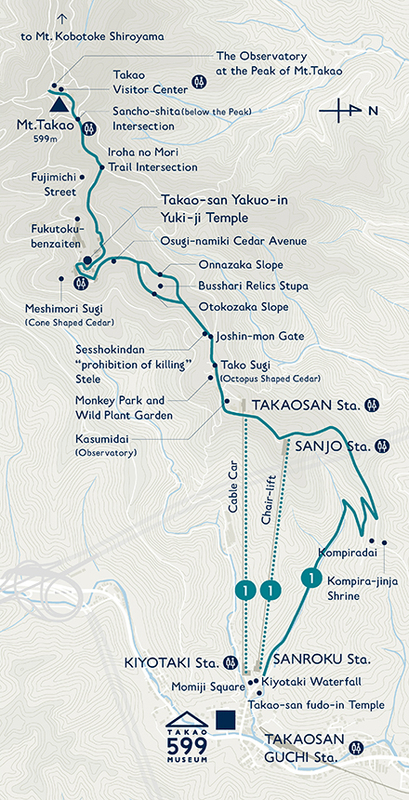 In order to go to Trail 6, take the paved street along the stream from the left hand side of cable car Kiyotaki station. There are some residence along this street and cars run, please be careful when walking on the street. Right after the trail start, several stone Buddhist image are placed on the left side of the road. It has been told that these stone Buddhist images are remains of Senshin-Zenin temple. Fudo-myo-o, Jyuichimen-kannon and seven deities of good fortune is placed in line as if they ware watching over. It is also appreciated because it is unusual to see seven deities of good fortune in one place. As the building of Tokyo Takao hospital is in sight, visitors can find the entrance of Trail 6 in front of Myo-on-bashi. It starts with the gentle slope but gradually become more like a mountain trail with tree roots and rocks protrude. It has been told that Kobo-Daishi (Kukai) descend from the mountain after ascetic training and saw a mother and a child are stranded due to the storm. Kukai felt sorry and started to pray against the fall. The rock collapse and the cave was created. A mother and a child could shelter from the rain. Biwataki waterfall is on the left trail from the intersection. Jyataki and Biwataki waterfall are famous venue for ascetic training under waterfall. In the ancient period, a high priest has lead by the deer in Mt. Takao and met the white haired old person playing biwa, a Japanese lute and asked for advice. Then this person disappeared and the waterfall like this person's hair appeared. 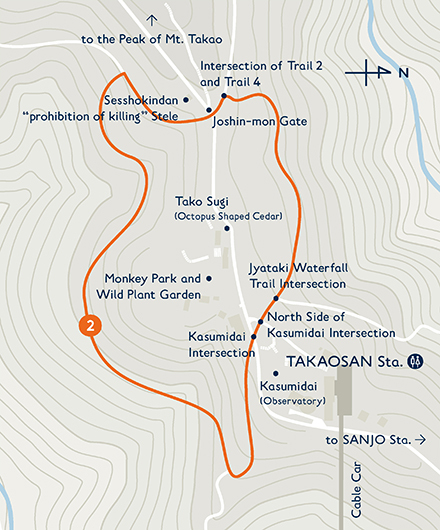 In order to be on Trail 6, go back to the intersection because the stairway by the temple will lead to Kasumidai on Trail1. The mold grow on rocks due to high-humidity and the trail become slippery. Please watch your steps. After going through rough and steep trail, the bench is placed at a curve along a large tree where climbers can have a break. There is a wide rest place near Daisanbashi bridge over the valley. When the water flow is slow, touch the water to refresh or flip the rocks on the water ground to observe underwater insects. Intersection with Mt. Inari Trail. The path is connected to Mt. Inari Trail after crossing the wooden bridge over the valley. From this point, walk by using the stepping stones in the valley. And there is a long stairway at the end of Trail 6, if climbers are not confident of their health condition, it is possible to change to Mt. Inari Trail. After passing through the bridge, the trail is to ascend the valley. To go further, steppingstones placed at intervals. Please select the shoes with non-slippery sole. When ascend the valley all the way to the ridge, the trail become gentle but again long wooden stairway appears. This stair's size of one step is large, thus there are many people taking a rest. There is a wide open space after going up the stairs and is connected to the intersection with Trail 3 and Trail 5. Taking Trail 5 to the right leads to Trail 1 below the summit, to the left lead to the bottom of stairway of Mt. Inari. This place is used to rest when the trail to the summit is congested. This trail is to the peak of Mt. Takao via Mt. Inari which is located at the south of Mt. Takao and provides different sceneries every season; Hydrangea and Gold-banded Lily bloom from June to July, and autumn foliage pleases hikers’ eyes in autumn. You can enjoy the trail on the mountain ridge with lots of sunlight. Do not miss to check the panoramic scenery from the observatory deck. The bridge over the stream on the left of Kiyotaki station is the entrance of Mt. Inari Trail. Go up the stairs covered with trees. The narrow and steep wooden stairs continue until the trail reaches the ridge. To pass by or go by is not easy and climbers line up during busy season. In the middle of the stairway, the temple of Asahi Inari appears on the left. From this point to the ridge, the slope becomes more gentle. Once the trail is on the ridge of mountain, the slope is gentle but the ground is bumpy with rocks and tree roots protrude. Please watch your step. The summit of Mt. Inari (396 above sea level), also a name of this trail, is at the stairway on the right from the intersection. There is the observatory Higashiya and rest room. From the summit of Mt. Inari, it is possible to go further by taking the trail along the Higashiya and the rest room. The gentle slope continues on the ridge. Again, the wooden stairway. Once this part is over, the trail become rough and bumpy with tree root protrude. After the gentle slope, there is a wider width trail with some benches for taking a rest. Once the boardwalk is over, there is a path to Trail 6 along the stream on the north. Turning right and go down the hill will lead to the stream with stepping stones on Trail 6. There are some benches in front of the intersection. From the intersection with Trail 5, the stairway over 200 steps continues. It is almost at the summit. Those who are not confident of own physical condition, it is recommended to take Trail 5 instead to go to Trail 1 below the summit area. This trail is from Hikagesawa to the peak and has trees those initials are 48 characters of Japanese old alphabet called Iroha. Each of them has information board and Japanese traditional poet called Waka related to the tree is written on there. Some parts of this trail have wooden stairs as it is a relatively steep one. On Iroha-no-mori Trail, the trees which name start with each character of Irohanihoheto 48 ancient alphabet are planted and trees descriptions are displayed along with stone monuments with a waka poet such as the Anthology of Myriad ［Ten Thousand］ Leaves engraved. The old name or regional name is used for same kind of tree. This trail provide the interesting point of how culture developed while enjoying climbing and nature. After crossed with Trail 4, it will be connected to the middle of Trail 1. Iroha-no-mori Trail is mostly in forest as its name states, mori means forest in Japanese. There are many steep slopes and stair-like steps but benches are placed at intervals. Climbers can have a break once in a while and enjoy climbing with waka poet on the wooden tag. This trail is from the entrance of Jyataki Waterfall Trail to the Kasumidai where cable car TAKAOSAN Sta. is located, and along the cool stream with Jyataki Waterfall. When listening carefully, hikers can hear birds chirp and sing and may encounter rare animals. This is the one of the best trails to avoid the crowded main one. This waterfall and Biwataki along Trail 6 has long been known for the place for ascetic training under waterfall. Seiryudo temple building is on the top of stone steps and enshrines the deity of water. It has been told that a monk has been looking for hallow ground. The monk has been guided by a white snake to find this waterfall. This white snake is Seiryu-daigongen. This place has been a place for followers but anyone could experience the training with reservation. Take the bus bound for Kobotoke from North exit of Takao station. Get off at Jyataki-guchi bus stop and walk towards the direction of Kobotoke. Turn at the sign “Jyataki ascetic training under waterfall” and walk along nursing home and this street become uphill and will find Jyataki. The street from the bus stop to Jyataki is paved. Ura-Takao is the area along Kyu-Koshu Kaido Road which runs from east to west on the north face of Mt. Takao. The main attraction of the area is Takao-baigo, dotted with many plum groves, are located from the start of the Kyu-Koshu Kaido Road to Kobotoke bus stop in about 5km. There are over 10,000 red and white plum blossom trees in total. From February to March, the plums bloom with beautiful scent and the entire area becomes very crowded. Be well prepared for the climbing. No littering. Pick up and carry out your own garbages. Do not deviate from trails. Do not capture or harrass wildlife. Put out fire completely after use. Please help keep public facilities such as restrooms clean. No vehicles including mountain bikes. Do not run on trails. It often happens that we see rolled-up leaves like a hand scroll in round-and-round dropped on the trail ground during the early summer at Mt.Takao. Insects belonging to Otoshi-bumi (Attelabidae Billberg) deposit their eggs into this rolled-up scroll leaves, which is why these curled up leaves are called 'Cradle for Otoshi-bumi (Attelabidae Billberg).' Female insects belonging to Otoshi-bumi (Attelabidae Billberg) develop a hand scroll using young leaves during the early summer and deposit their eggs in there. Various kinds of insects belong to the group of Otoshi-bumi (Attelabidae Billberg), however, it depends upon what kind of leaves used for a cradle and how to roll up, while some kinds of Otoshi-bumi (Attelabidae Billberg) cut off the rolled-up leaves. Mt. Takao is the birthplace of 'Garbage Bring-Back Campaign.' As the symbol of this Campaign, 'A Cleansing Boy' have been constructed at the open space in front of the Kiyotaki station of the cable car (Trail 1 (Omotesando Trail) ) and the top of Mt. Takao. No trash cans are set within the area of Mt. Takao. Let's bring back our own garbage instead of throwing away in Mt. Takao in order to hand down this abundant rich nature to our children in the next generations. In Japan, the stories related a a mythical creature Long-nosed Goblin, which is said to dwell deep in the mountains have been handed on to the next generation in various places. In general, it is said that Long‐nosed Goblin (Tengu) wears the costume of an itinerant monk with a ruddy face and a long-nosed, wings on the back, •a round fan or a sword in the hands. Tengu in Mt. Takao is obedient to Iizuna Daigongen, a principal object of worship at Head Temple Takao-san Yakuo-in so that it is said they ward off evil. We can see how those Tengu look like in a large statue of long-nosed Tengu just in front of Iizuna Gongen, a small statue of Tengu with bird's beak (so-called Crow Tengu). Tengu is one of the symbols so that we can see it such places as at the platform of the Takao Station, Tengu statue at the just side at the ticket gate of the Takao-sanguti (Mt. Takao Entrance) Station, souvenir shops at Mt. Takao, and so on, which means it's everywhere. There is a cherry blossom called 'October Cherry' near the Kiyotaki station of the cable car, at the entrance of Trail 1 (Omotesando Trail), and near stone monument at Takaosan Yakuo-in Temple. This cherry blossom bloom twice, in spring and autumn. Depending upon the occasion to bloom, you can have an fortunate opportunity to enjoy the contrast between cherry blossom and autumn colorful leaves. As for Japan's No.1 regarding the cable car of Mt. Takao is the steepest slope of the cable car passing through. There is the cable car available between the Kiyotaki station (201m above the sea level) and the Takaosan station (472m above the sea level) run by Takaotozan Railway Co.,Ltd. This cable car ascends the Japan's No. 1 steepest slope (31' 18'') based on the Railway Business Act. Fagus crenata famous for its vegetation in Shirakami mountain range, world natural heritage inhabits at Mt. Takao about 50km from heart of Tokyo.. Have you known it? As for Mt. Takao, it is recognized that a dozen of Fagus crenata around Mt. Takao station of Takaotozan Railway Co.,Ltd and the top of Mt. Takao. We seldom see Fagus crenata around the Tokyo metropolitan region because Fagus crenata inhabit at where it's higher latitude with low temperature. Fagus crenata at Mt. Takao are mostly about 200 to 300 aged with rare young trees discovered. A likely explanation is this is because Mt. Takao which was 200 to 300 years ago during Edo-Era had been in the age of Little Ice Age, when it's cold for Fagus crenata to grow, while it's too hot for them to grow. 'Epiphyte, air plant' which ia plant that derives moisture and nutrients from the air and rain growing on the trees at Mt. Takao. One typical plant is 'Sekkoku' (Dendrobium moniliforme), which we can see them mainly on the branches of Japanese cedars at Trail 6 (Biwa Waterfall Trail) from the late spring to the early summer with the flowers in white or salmon-pink. Or else, 'Kayaran' (Thrixspermum japonicum) and 'Yourakuran' (Oberonia japonica (Maxim.) Makino) can be also seen. They say about 1600 kinds of plants have been found and recognized at Mt. Takao and on it's periphery, which means Mt. Takao has an affluent kinds of plants that is equivalent of the entire number of kinds of plants habiting in whole England. Thus, lots of researchers have been to Mt. Takao for fieldworks so far since decades ago so that as a result over 60 new breed varieties have been discovered to result in giving them names associated with Mt. Takao, such as Viola yezoensisf. discolor, Saussurea sinuatoides, and others. 1. Mt. Takao is located just on the border between warm-temperate zone and cool-temperate zone by its climate so that plants which distribute in each zone jointly inhabit at Mt. Takao. This is why. 2.Furhermore, Mt. Takao has been preserved and protected as the object for mountain worship since Nara Period (710-794 CE) as well as by the highest statesmen of the administrations at that time such as Hōjō Family clan during Warring States period (of Japanese history, approx. 1467-1568 CE) and Tokugawa Shogunate (i.e. the Edo Shogunate, 1603-1867). Currently, it's also designated as 'Takao Jinba Prefectural Natural Park (Tourist Takao Jinba shizen kōen, a Prefectural Natural Park in Western Tokyo, Japan, established in 1950)' and ''Meiji no Mori Takao Quasi-National Park (in Hachioji City, Tokyo Prefecture)' to preserve the mother nature of Mt. Takao. There are 6 places and mountains in total around Mt. Takao, which are named 'Shiroyama' such as Kobotoke Shiroyama. Accordingly, as the name is telling, it is said that each place once used to be the place the Castles had been constructed such as Hachiojijo-castle and Takiyamajo-castle in the Middle Ages including the Age of Provincial Wars. This facts is telling that the whole area around Mt. Takao was very meaningfully of great matter to Samurai as a military base as well as an important point in the transportation which Koshu-kaido Road (one of 5 main transportation roads) and other main Roads intersect. Mt. Fuji seen from the top of Mt. Takao is widely known, while do you know you can see the Sky Tree, which is the tallest tower in Japan, too? As you can have a beautiful night view of scenery of a metropolis at night, Mt. Takao is well-known within the Tokyo Metropolitan area as a night view spot. Moreover, you can have a fortunate opportunity to watch so-called 'Diamond Mt. Fuji' during several days around the winter solstice in December, which is happening because the sun set behind Mt. Fuji seen from the top of Mt. Takao so that the view looks like a diamond shining on the top of Mt. Fuji. They say that about over 4,000 kinds of insects inhabit in Mt. Takao so that it is called as 'Three Greatest Insects' Habitats in Japan' alongwith Minooyama in Oska and Mt. Kibunesan in Kyoto. Mt. Takao has been a major place for fieldwork on study of insects because it has large variety of wide range of insects' kinds and located near the Tokyo Metropolitan area for a long time. Or else, Mt. Takao is called 'Sanctuary of Entomology' as well. This is because there are lots of species that have been discovered for the first time at Mt. Takao, such insects as Pseudopanolis takao, Hiradonta takaonis, Stenhomalus takaosanus Ohbayashi, and others. Among various insects, above all, 'Mukashi Tonbo (Epiophlebia supersets (species of living-fossil dragonfly endemic to Japan) )' and 'Asagimadara (chestnut tiger butterfly (Parantica site) )' are both famous. We can see this 'Clayslate' close around the mid of Trail 6 (Biwa Waterfall Trail). It might have touched by numerous visitors to get smooth and glossy in part. Mt. Takao is very crowded with battalions of tourists during the daytime, while a different scenery reveals at night. In the dark night forest Musasabi (Japanese giant flying squirrel) are flying from a tree to another like flights in gliders with a membrane between forelegs and hind legs spreading wide open. Mt. Takao has lots of Musasabi (Japanese giant flying squirrel) inhabiting within the precincts of Takaosan Yakuo-in Temple and other places, therefore it's famous as a place for Musasabi watching. They show up out of the nests about 30 minutes after the sunset. Have you ever seen the places where the branches used to grow after all the leaves have already fallen off? What's like after the leaves are all gone is called 'Youkon' (leaf scar), which is the remains of Plant Vascular Bundle (a strand of primary conductive plant tissue consisting essentially of xylem and phloem through which water and nutrition are carried). Sometimes the 'Youkon' (leaf scar) look like faces of animals and others, sometimes they inspire our imagination. Such as 'Youkon' (leaf scar) of 'Karasu-zansyo' (Zanthoxylum ailanthoides) resembles the face of monkeys, and the one of 'Oni-gurumi' (Manchurian walnut (Juglans mandshurica) )) the face of sheep. Watching 'Youkon' (leaf scar) is really one of the funs at Mt. Takao. The number of the wild birds that have been recognized at Mt. Takao sums up to about 150 kinds. What this means is one third of the kind of the wild birds recognized in entire Japan (about 550 kinds) is observed at Mt. Takao. Therefore, Mt. Takao is also known as and famous for a leading 'Bird Watching' spot in Tokyo. There are trees beginning with A to Z along the 'the ABCs Forest trail course' to go upwards the mountain from Hikage-sawa to the Mt. Takao top with the explanations of each tree displayed. This 'the ABCs Forest' trees and plants are chosen from mainly Manyoushuu (famous 8thC poetry); Japan's oldest anthology of poems, in which those trees and plants had been composed. Therefore, each relevant poem from Manyoushuu is being displayed to explain so that visitors can enjoy them during their trail. Nature that is rich and plentiful at Mt. Takao has been highly valued abroad as a sightseeing destination that is worthwhile foreign tourists to Japan taking time to visit. Michelin, a French guidebook publisher renowned as rating the restaurants or hotels worldwide, released a new travel guide for foreign tourists to Japan in 2007, 'Michelin Voyager Pratique Japon' or a Japan travel guide book 'Michelin Green Guide Japon' in 2009, in which Mt. 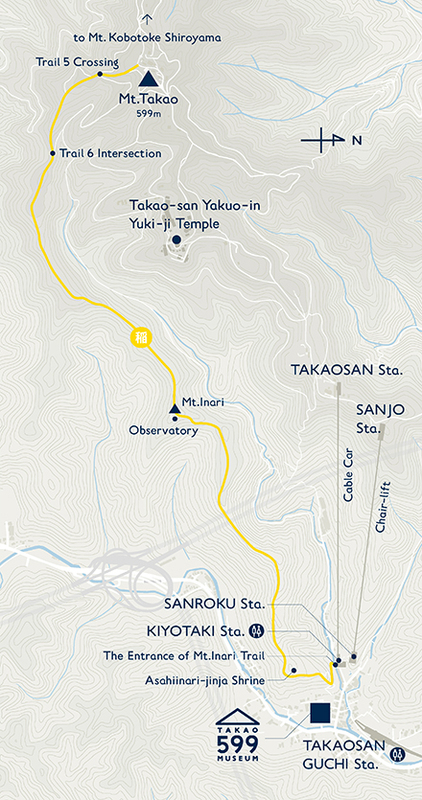 Takao has been selected as 3‐star classed sightseeing destination alongside Mt. Fuji. They say the reason Mt. Takao has been chosen is Mt. Takao has nature that is rich and plentiful even though it is located near metropolis, the Tokyo metropolitan region. Mt. Takao has been selected as many of 'Top Hundred Best' as its splendid nature, view and scenery are highly assessed. The geologic stratum that forms Mt. Takao is so-called 'Kobotoke Group' geologic stratum. This geologic stratum just in the west of Mt. 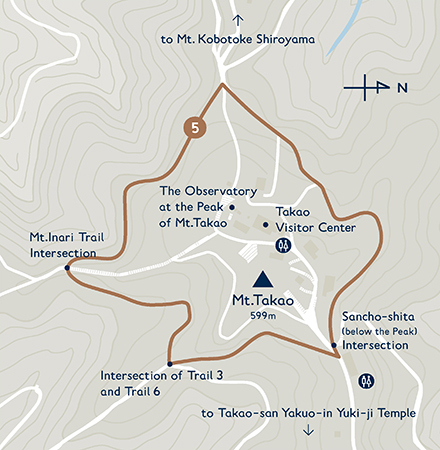 Takao has been named after Kobotoke-toge Pass, which is very thick and widely spreads around Mt. Takao toward the western region till Kanagawa Pref. and Yamanashi Pref. Walking along the pass alongside mountain streams of Mt. Takao gives you a good opportunity to watch alternate successive layers composed of sandstone, clayslate, and shale being pilled up. In some places, you can watch charts. It took a long time till fossilized remains were dug out from this geologic stratum 'Kobotoke Group' to clarify which age 'Kobotoke Group' was formed. A genus of filibranchiate bivalve mollusks, however, called inoceramus was dug out in 'Kobotoke Group' geologic stratum in Yamanashi Pref., which finally has figured out that 'Kobotoke Group' had been formed during Mesozoic Cretaceous period, about a hundred million years ago. The Japanese archipelago was an easternmost land connected with China by land during the middle of the Mesozoic age till the beginning of the Cenozoic age, and both the seacoast of the Pacific Ocean of the western part of Japan and the center of Hokkaido were under the sea level, in the sea. The western part of Tokyo used to be a widely opened large bay facing the south, which consequently contributed to form the layers of sandstone bed and clayslate pilled up on the seabed, which had been formed Mt. Takao and Kobotoke toge (Kobotoke toge Pass). This piled-up layers during Mesozoic Cretaceous period under the water had taken a long time afterwards being raised above sea level, subject to erosion, which resulted in forming the current shape of Mt. Takao. The differences on the landforms and vegetation show the ones in the changes of temperatures and distributions by the characteristics such as a submontane district, mountainside, and the mountain top, or southern slope and northern slope, or oak forest and Fagus japonica forest in Mt. Takao. For instance, the figures are the ones that show how the temperature of winter morning distributes, however, it is not with this case that the higher we climb Mt. Takao to the top, the lower the temperature gets. As one of the characteristics at Mt. Takao, there is a spot in the mountainside that the temperature is high (warm), and is a spot in a submontane district that the temperature is the lowest (cold) and also lower along the ridge to the top. This is because an air mass that is cooled down during the night slopes down toward a submontane district to be alike a lake of cold air to result in, consequently, temperature turn-around happens with warm air mass formed at the mountainside slope. The warm air mass at the mountainside caused by this turn-around air mass develops especially good enough at the clear and quite night, or else it happens on the clear day in other season.